After becoming indie darlings and getting as big as being the musical guest on Saturday Night Live, it's hard to listen to Fleet Foxes now without preconceptions. A band that gets so much hype goes through the trappings of being the best new thing all the way through the backlash and being panned for being too hip. Sitting back down with Fleet Foxes self-titled debut and Sun Giant EP, it's hard to deny that this is a band that wrote some tremendous songs on their first full length. Much like Vampire Weekend (whom I'm not a fan of), Fleet Foxes will have an unfair amount of expectations to live up to when their second album is finally finished and released. Anyway, back to the point of this post and one of my favorite songs of the decade, 'Mykonos'. 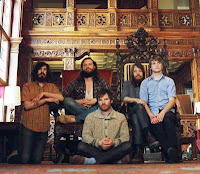 A year or so before Fleet Foxes hit my ears Midlake's album The Trials of Van Occupanther had gotten me back into 70's Americana/easy listening stuff like Fleetwood Mac and Crosby, Stills and Nash. I was looking for something else new that fell into that same category and Fleet Foxes came around at just the right time. When I first got the Sun Giant EP, I knew after the first spin that I had found one of my new favorite bands. The best song off that album without a doubt is 'Mykonos'. I was hooked within the first thirty seconds as I couldn't shake the feeling that these guys liked the band America a lot. That's not a bad thing either as America wrote some of the better country tinged pop tunes in the 70's and 80's (including the soundtrack for The Last Unicorn). The best part about 'Mykonos' is without a doubt the breakdown at the end. I'm a sucker for harmonies and Fleet Foxes don't disappoint on that note. Choice! Mykonos and Your Protector are two of my favorite Fleet Foxes tunes (so far). As "easy listening" as they are, damnit if I still don't pump my fist. Call me crazy, but I think we'll see a new sound from these guys in the future where they plug it in and let it all hang out. I think they got it in 'em.